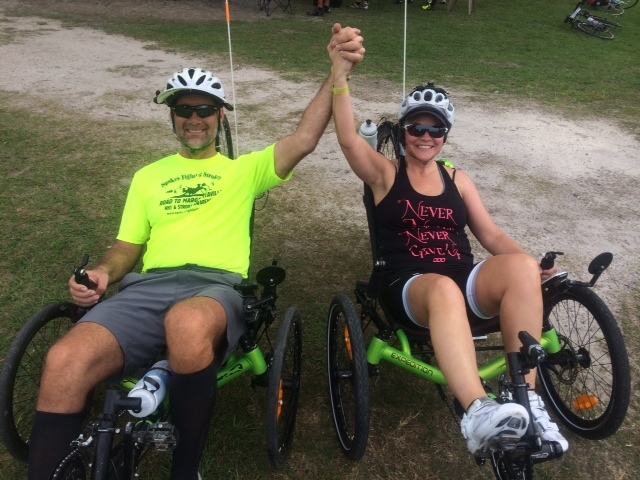 Trike pilot Dan Zimmerman is a man on a mission! He has been asking for support for his cause, and Trike Asylum is happy to spread the word. If you take a while to read his website, you will be duly impressed with what he has accomplished in 2014, and if you feel so inclined, you can donate to support his continued efforts in 2015 and beyond to help spread the word for stroke victims (Focus on your Ability, not Disability). 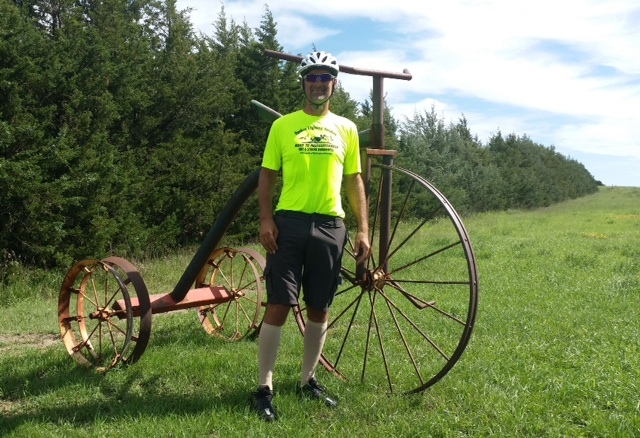 The human powered trike has made a huge difference for Dan, evidenced by the fact that he has thus far ridden one more than 5,000 miles across the United States, and continues to visit cities on his Catrike 700 to help all the people he can. Accomplishing a challenging overland trike journey brings a wonderful feeling! Dan and his amazing lady friend Catherine (Cat) both love how it helps them move far beyond their formerly debilitating brain maladies. 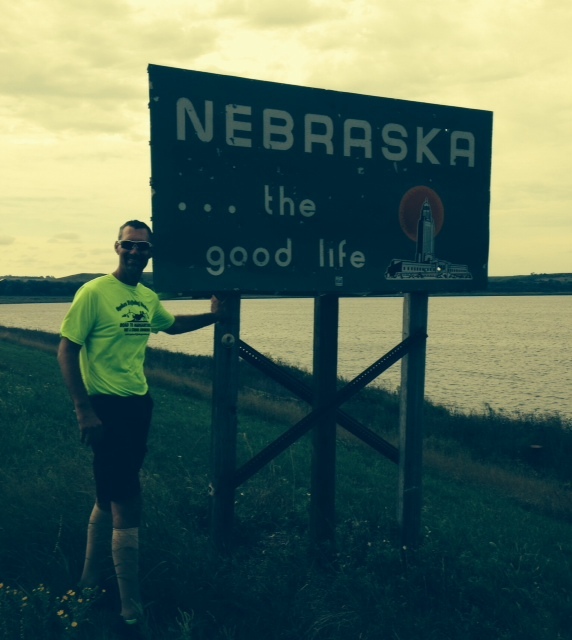 Dan rode 7,746 miles 2014. 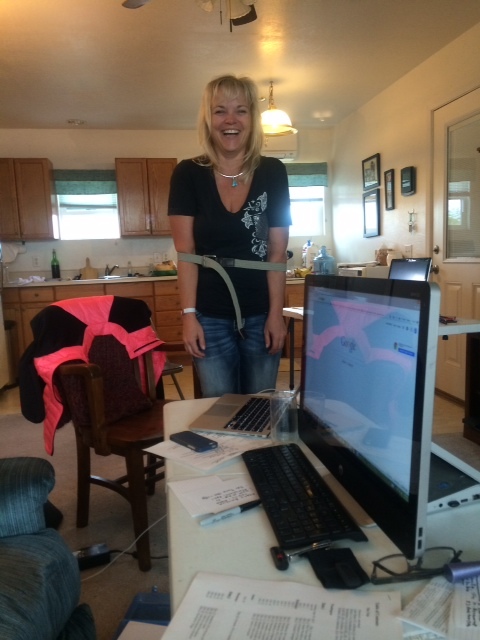 Cat rode 6,483 miles 2014. 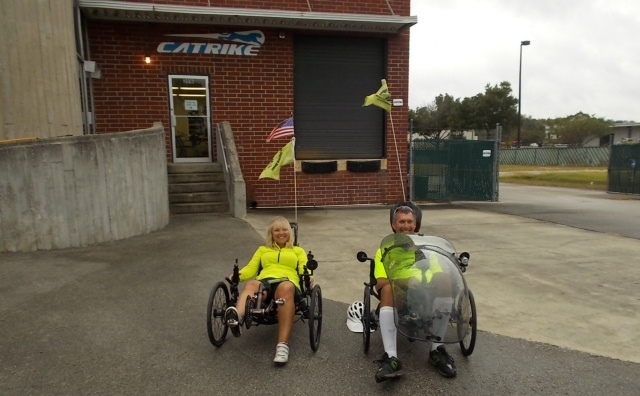 The two of them ride the ultra comfortable and fast Catrike 700 recumbent. 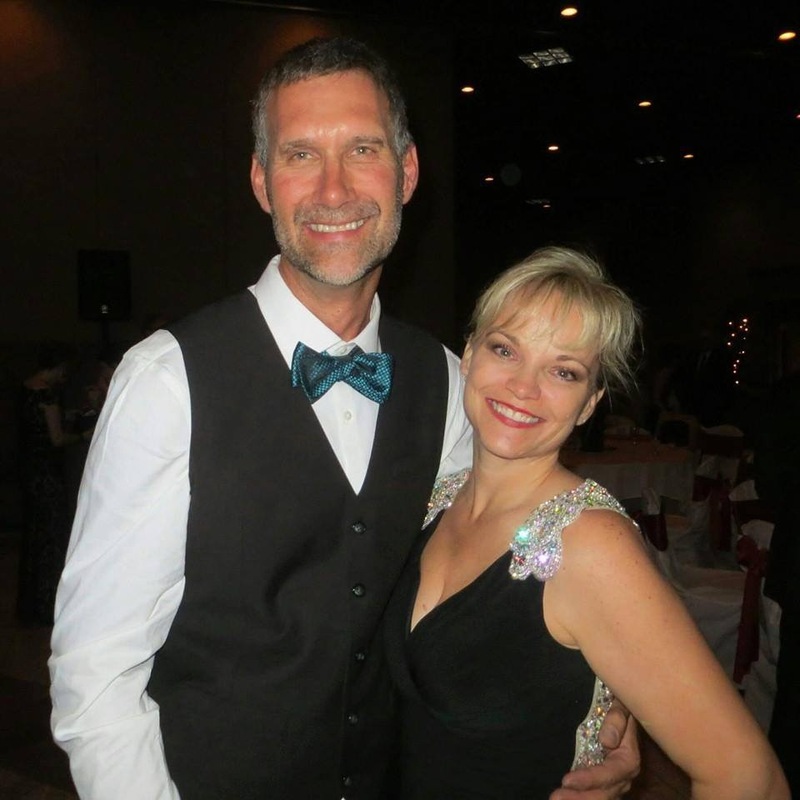 Catherine has joined Spokes Fighting Strokes as a board member and brings to the organization her education, (masters Degree in organizational leadership), and skills sets with marketing and networking which she will apply to grow SFS. Catherine has followed her own calling and found her voice by starting her own foundation “Hope For Trauma“. 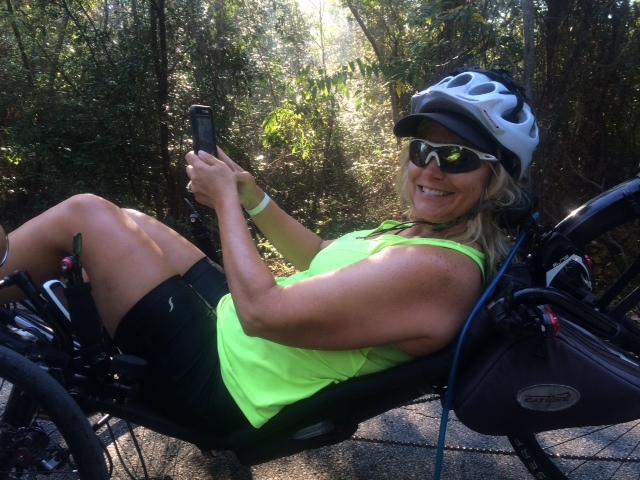 Both foundations focus on recumbent cycling and recovery. Cat and Dan have found that by working together and sharing their stories together, they have a greater impact and can be more effective. 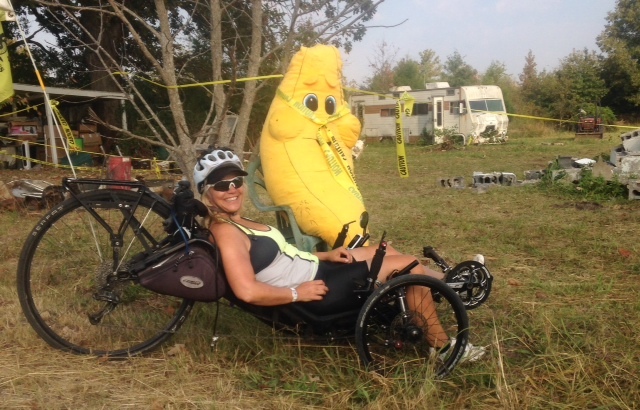 Both attribute recumbent cycling to being KEY on their road recovery. 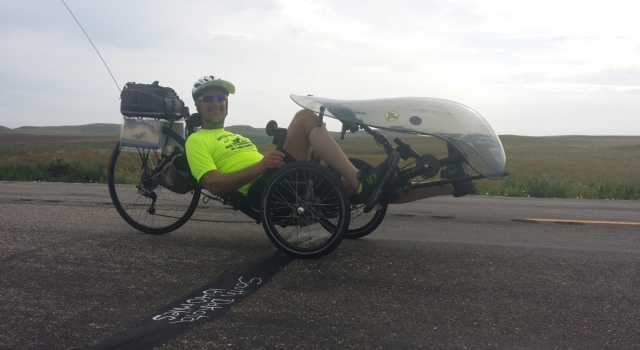 Dan Zimmerman, a regular Trike Asylum reader, has pedaled his Catrike 700 recumbent tricycle across the United States of America as part of his Spokes Fighting Strokes campaign to bring awareness of focusing on one’s ability, not one’s disability! 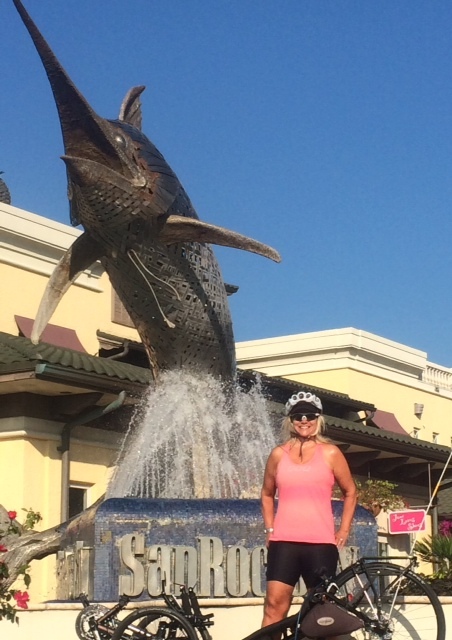 Dan left June 29, 2014, from Anacortes, Washington and pedaled his 700 all the way to Key West, in Florida. You can read about his ride on the Crazy Guy on a Bike journal page HERE! The cross country crew stops at a much cooler location on the way to Florida. The organization’s official campaign logo. You can be part. 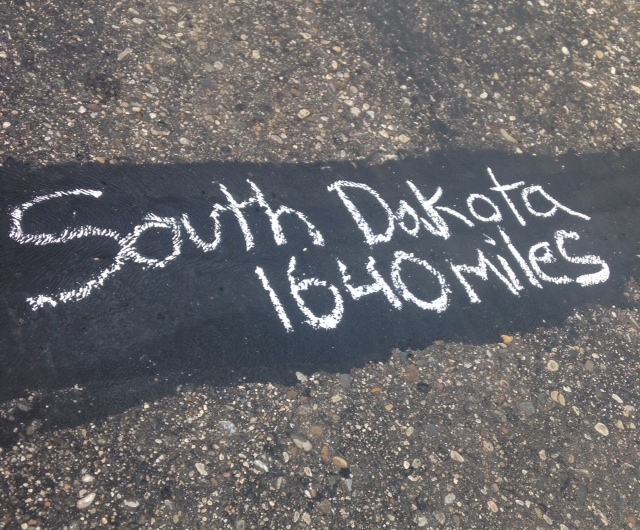 This is the 5,000+ mile route that stroke victim Dan Zimmerman rode on his Catrike 700! Dan’s 2015 (and beyond) map of scheduled visits to support stroke victims. Donations are still being gratefully accepted to help offset funding necessary to make this possible. Dan Zimmerman was born in 1964 in Menomonee Falls, Wisconsin, the second of three boys in his family. His parents divorced, and Dan lived with his father in Minnesota for eight years before returning at age 10 to live with his mother in Wisconsin. Dan’s industrial arts teacher in high school sparked his interest in woodworking. By the time he was 16, Dan had saved enough money from odd jobs to buy a table saw, band saw and joiner and set up his own wood shop in the family basement. He soon had a booming business making miniature furniture for customers of a dollhouse shop his mother had started. Tragedy struck the family when Dan’s older brother, Kevin, died at age 19. Tests later revealed that both Kevin and Dan had HHT (Hereditary Hemorrhagic Telangiectasia ), a disease in which the lungs fail to filter clots efficiently. Dan had the first of periodic surgeries to treat his HHT and graduated from Sussex Hamilton High School in 1982. He got a job in a cabinet shop and continued his woodworking business on the side, paying his own way through Milwaukee Area Technical College. He graduated in 1983. During a vacation to Arizona, Dan’s stepfather accepted a job at a Pontiac dealership, and the family moved to metro Phoenix in 1984. Dan worked briefly for a furniture maker, then used his woodworking equipment to start his own cabinet and furniture-making business in 1985. Woodworks by Dan eventually grew to more than a dozen employees and more than $540,000 in annual sales. As he worked 80- to 100-hour weeks, Dan also married and had two sons of his own — Josh, born in 1997, and Zach, born in 2001. But his marriage soured, and he moved into his shop while divorce and custody proceedings dragged on. In 2005, at age 41, Dan suffered a stroke that paralyzed his right arm and leg and damaged the left side of his brain. A hospital doctor told him that he would never walk or talk again. Angry, Dan knew he had to give up or fight. His early life with his father, a railroad conductor who worked all hours and drank more than he parented, had left Dan determined to work hard and do better. Dan knew his sons needed a father, and he decided to shut down his woodworking business and concentrate on recovery. It took eight weeks before he could hobble with a walker. For six months he visited job sites in a wheelchair, pointing to communicate as the company wrapped up projects. It took a year before he could talk, and three years before he could read and remember. He married — once for love, once for health insurance — and divorced two more times. He now lives in Scottsdale, and his main source of income is rent from his woodworking building. By 2008, Dan wanted more mobility than his wheelchair afforded. His first tricycles were too heavy but offered him the “freedom, plain and simple,” that he craves. He bought a lightweight recumbent trike in 2009 and began riding with the ‘Bent Riders of Arizona on weekly rides and weekend tours. He logs 500 to 700 miles a month and in 2012 rode more than 350 miles from Phoenix to San Diego in eight days. Cycling, Dan says, has improved his health and more importantly, given him a purpose in life. He wants to raise awareness of HHT, the disease that killed his brother and mother and is present in Dan and his younger son. He also wants to raise awareness of stroke prevention and inspire other stroke survivors to fight back against the disease. Click image to visit Dan’s Spokes Fighting Strokes website. See more photos of Dan’s rides on his website HERE. Raising awareness for Strokes, HHT & Brain Injury. Sadly We can’t do it alone. 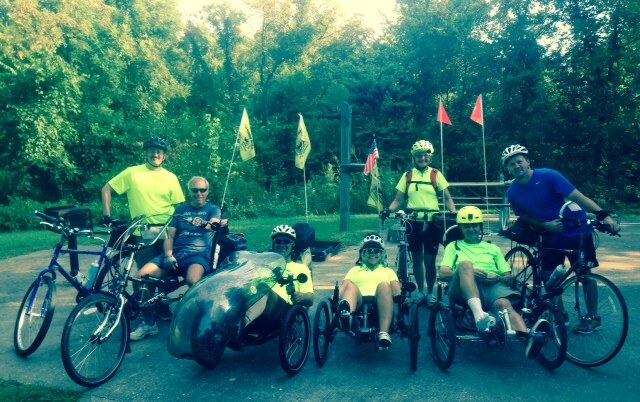 This summer, the plan is to travel to various states Dan’s Chevy truck pulling 30 RV trailer and recumbent trikes to speak at various pre-arranged facilities in order to raise awareness of HHT, strokes, and brain injuries. The logistics are still in the planning stages and partnerships are still being formed in various states. We feel so happy to have a sense of purpose. Now it’s time to think about helping others. We are in late planning stages of this event and relying on support from you to help us achieve our mutual goals. Dan estimates the cost is just over $7300. Dan has asked family and friends if he could park the RV in their driveway to save $$. which is a great start! Please help! 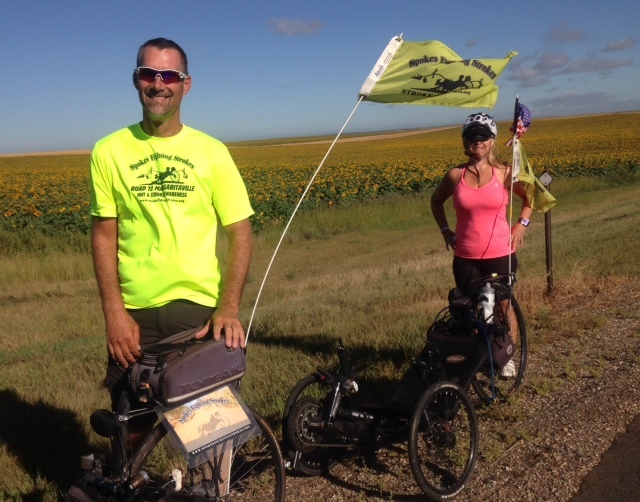 On our last years ride across America, 5390 miles, we learned a lot about logistics of planning, handling media, managing social media and triking for awareness. People flocked to us on these trikes. They are curious about the trikes, they are curious about our stories. Our stories are powerful. We all know facts tell, stories sell. We are sharing our personal experiences with the Hope of making the world a better place for tomorrow. 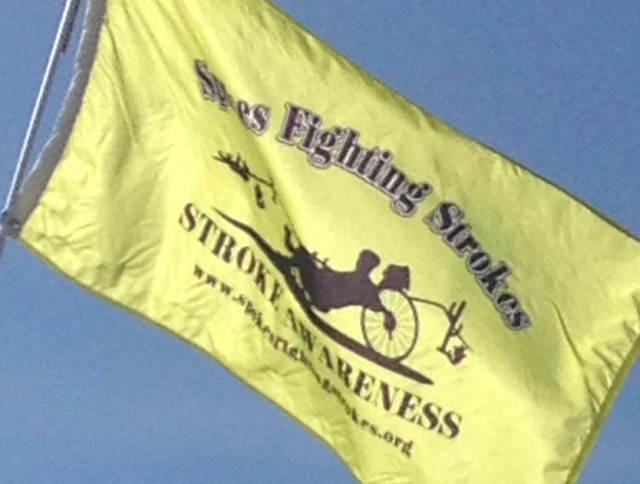 Please support us today by donating on www.spokesfightingstrokes.org. We are a 501(c) (3)tax exempt organization. Donations may be tax deductible, please see your accountant for details. Rail trail is Not loop, so double miles.